Yesterday, a friend told me about an incredible conversation that she had had with her Autistic niece. The girl, like Brooke, is ten, soon to be eleven. The conversation is not mine to share, but truthfully, the details don’t really matter anyway. What matters for this post is that it left me feeling something. Something uneasy. A disconnect. Even envy perhaps, though I don’t dare to say that out loud. You see, the conversation that my friend had had with this extraordinary kid was so far removed from where we are with Brooke that it was nearly unrecognizable to me. I was happy. God, I was happy for this kid. For her self-awareness and her emotional maturity and her ability to express herself and her feelings. I was happy for her. And yet, something nagged at me. It’s not where we are. It’s not our autism. Not even close. “See what, baby?” I asked. “See my face of how I feel,” she said. I looked at her face, a caricature of sadness. “You don’t look very happy,” I said. “Do you know why you feel sad?” I asked. Her answer was as huge as it was heartbreaking. The amount of progress that she’s made to get to a place where she can tell me that much is mind-blowing, not to mention the work that she’s done to get there. I don’t discount it, nor do I allow it to be cheapened by comparison. I really don’t. And yet, my friend’s story about her niece … it lingers in the air. Because as happy as I was for her, somewhere deep my heart hurt for Brooke — my girl. For her frustration, her confusion, her overwhelm. For the fact that she cried into her mama’s shoulder that night with no words, no framework, to tell me why. And I thought of you – you who come here and read my words. You who so generously revel with me in Brooke’s consistently astounding progress. You, the parents out there who read these stories about a kid who can say, “I’m sad,” and who think, “That’s great, and I’m happy for you, but that’s not my kid,” or you, the Autists who say, “That’s not me.” And who, while genuinely celebrating with us, are also hurting somewhere deep for someone who’s just not where we are. And I want you to know that I get it. That I don’t ever pretend to know what you live — what your children live. I don’t. And I don’t know what to do about it other than to say it out loud. To tell you that I get it. 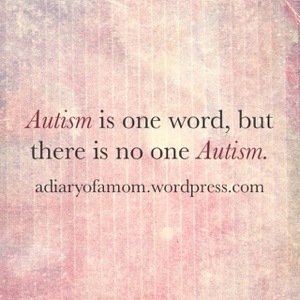 And to say again what I’ve said a thousand times before, that while Autism is one word, there is no one Autism. That its iterations and manifestations are so varied as to, at times, make their singular title, as appropriate as it may be, feel like a cruel joke. What Autistic people share is important. Their commonalities deserve attention and demand validation. Shared experiences create community and community creates empowerment. That matters – a lot. But so too, we have to acknowledge the differences. We have to say at every turn, assumptions based on a single word don’t work. Bifurcation of a spectrum of human beings by what we perceive to be “levels of functioning” doesn’t work. Autistic people may all be Autistic, but, by God, first and foremost they are people. And people, no matter how much they share, are different from one another. One characteristic, no matter how pervasive, cannot be the sole descriptor of an entire group of human beings. So if you read my stories and say, “That’s not my kid,” or, “That’s not me,” I get it. I really do. I tell my story here and I help my daughter share hers. It’s all I can do. Only you can tell yours, or, if you’re a parent, help your child tell theirs. And if you do, if they do, if we all do, eventually we’ll be able to show the world just how varied, how three-dimensional — and how beautiful — this prism really is. I like the concept of the Autism Prism. In addition to all of its other attributes it shines. But sometimes, it’s ok to not ‘figure’ it out. Just to let sad be sad, without a big long story attached to it….. Absolutely agreed. It really felt like she was looking for my help though, rather than simply seeking validation of how she was feeling. But, hey, I might have been reading it the wrong way. Such is always the risk. Oh how I have tortured myself with the sentiments you’ve described. And in the next breath I feel guilty for feeling guilty. I’m afraid that if I stop “coveting” the next best thing for my dd, I will become a lazy mother who accepts mediocrity. This world IS so performance oriented. What will become of my child if her performance always falls in the 0 percentile? What if she never finds her soulmate? What happens when she realizes (and I can tell that she will do this someday) that she wasn’t dealt a level playing field at birth. And I don’t say that in disrespect to her personhood but there is no denying that just about everything is incalculably difficult. What about when she realizes her siblings live a life of easer compared to hers? I wish the world was filled with people like you. not “better” than they were the day before. Add mental illness to this (hers, not mine). Mental illness, to be honest, is probably the bigger “thief” in her life. Jessica – thanks for an honest post. Add’s integrity to your blog, imo. I love my dd to the moon and back but I will never be happy that she must work SOOO hard for such little gain. Because she deserves something to be easy for her. She’s earned it. She didn’t ask to struggle on a moment by moment basis. I so get it. I have two that are on very different places on the spectrum. And I’m still at that place where I’m trying not to compare to their neurotypical peers, too. It’s hard to just focus on yourself and your family when it seems like everyone is open and sharing (and sometimes over sharing) everything. But I’m reminded this morning of Landon’s post last week, about his kite flying (and I think you posted it on your Facebook page, too). And JER wrote similarly in his books, too, and all the other autistic authors emphasize this truth that autistic people can and do wonderful things, can evolve and learn and grow, and continue to develop skills well past the age that our society has allowed for everyone else to have matured. And those reminders give me hope, just as reading your daughter’s journey does. We as parents have to wait a little longer, and our children have to work harder at it, but the progress, and the communication, and the richness? It will come. I already see the richness in your child’s life, and even though I don’t always care to admit it on my dark days, the richness is most certainly in my childrens, too. Hi there! Been reading for a while but never commented. Really like this piece. Big discussion recently on our mother’s FB support group over “cure” v “acceptance” ; the word “disorder”; and the whole Autism Speak thing. We discovered that the more impacted children’s parents wanted cure and relief for their child. We realized that the “lower” (I know, bad word) compared their children to the “higher” — we realized the “higher” compared themselves to the “neurotypical.” We realized that it was a big rat race of futility — yet, a constant presence of being tempted to being discontented with where our child is comparatively. We do that with much in our lives though — money, houses, children. It makes us restless and we have to fight the constant tension of this “more-ness” that we aspire to. I love the word “prism” too because we, and our children, are all a different kind of light — capable of brilliance, capable of shade. Definitely capable of shining in moments of grace. when i was first diagnosed with asperger’s, i read a lot about it online…and this was in 2005…there was less info, especially about asperger’s…and the stories i read were all about math savants…supremely high functioning savants with amazing gifts…and i was low-income, alone, depressed…reading those stories hurt, because they were presented as the norm, and i felt like even more of a failure…so, it made me want to be extra careful with my words, because i didn’t want to describe my own experiences and create similar feelings in others…the spectrum (or prism, which is even better) is so vast and contains so many different experiences, that it’s a huge challenge, learning how to communicate and share in a way that is respectful, cautious…basically, i don’t like it when anyone claims to speak for other people. it’s complicated, because i don’t know what the solution is. the vocabulary for the spectrum is lacking…it’s very, very easy to write about experiences and make others feel hurt, stepped on. my plan for years now…and i mean this…has been to use the Jess style of communicating…i can’t say autism or Asperger’s without using words that apply to people who are very different from me…so, i just try to say, regularly, “this is only true for me”…or lines like that, just to make clear this is only coming from my own experiences. i think your caution and your emphasis on finding words and phrases that protect feelings: it’s a beautiful thing, and it’s definitely helped me to find a way forward, in terms of sharing, writing. So much YES to this post. After reading your post, I read the post below – they fit together so well, it was amazing: http://strangeringodzone.blogspot.com/2013/12/why-i-stand-in-solidarity-with-low_2.html#comment-form – . My son is “high-functioning” most of the time – until he’s not. He can “pass” most of the time – until he can’t. His disibility is invisible – until it isn’t. When he’s overwhelmed, he looses his words – shuts down a little, falls apart a little – and it takes time to climb back up and put the pieces back together. He’s not quite 7. Not giving others the respect and dignity they deserve as HUMAN BEINGS, simply because it seems like they’re not aware that they “deserve it” is criminal and pathetically sad. If we Presume Competence, everybody wins. PK- I love the way you put it, passing until he can’t. That is SO my experience. My son “passes” so well that when he doesn’t, people don’t seem to remember why. I’ve been hesitant to get into a support group or seek certain services because I fear others won’t feel I deserve to be there. I don’t know any other moms like me. I feel guilt that my kid isn’t low enough to deserve sympathy. I feel heartbroken for my son who is still seen by most (including my family) who sees him as a discipline problem. Sounds like us, exactly. We’re in the midst of a really bad patch after a couple years of amazing progress. And thankfully his team at school has recognized that even when he’s “passing,” it’s because, in part, of the support he’s gotten and continues to get. We’re gearing up for high school next year and hoping we can maintain that delicate balance of letting him fly as much as possible yet having the supports in place for when he can’t quite manage on his own. Oh, yes. A Prism, indeed. I really love this post. Thank you for sharing it. thanks for this. I don’t think we can say this enough amongst ourselves. I’ve been on both ends of this. I’ve heard the sadness,anger, envy from others who perceive my son as living some sort of watered down version of real autism. I’ve also envied others whose autism seems easier on them than my son’s is for him/us. And I’ve felt huge guilt over feeling that. I’ve been at this long enough now to know those feelings come most often when I am feeling low on hope and alone in the hard stuff. And I know the only way I’ve found so far through it is to be honest, talk about it, as you just have, so those feelings don’t take up too much space and I can keep digging for what it is I really need in that moment. So, thanks – for talking about it and for saying it’s ok to talk about it. Saying it out loud is the best medicine for our hearts. Thank you for being truthful. As a community we have to celebrate the strides our kids make, and it’s also ok to say, “I wish we were there too.” Great post. I know I often feel uncomfortable when people tell me they want their children to look at me as an example of what they can be. And like Sparrow Rose Jones, I feel like saying, “No you don’t.” But I do get it. I get that the way I live seems light years away from their day to day experience. And in many ways, I am thankful for the life I live today, even though I had to work so incredibly hard to achieve it, with so little support. You are supporting your children. So they’re already better off. Even if they achieve something completely different. Achievements are what they are: not something that is better or worse than other people, but something that is better than who you were yesterday. And even if you regress again, nobody can take that achievement away. I have loved every one of your posts since I started following this blog a month or two ago. You have a talent for hitting the nail very squarely on the head. And your comments here are great as well. Thank you to all of you. I too have a son who passes for “typical” until he can’t. Even we forget sometimes and then have to remind ourselves to slow down and support him. And then there are times like right now where nothing seems to help and he is withdrawing from everything. So yes prism is such a great word over spectrum. Thank you for giving it to us. Jess, I have been following your blog for a little over a month or two now and I enjoy every post. This one moved me so much I had to comment. I am an SLP, and I do what I do because I believe everyone has their own voice — it’s my privilege to help some find and express theirs. Continue to be an advocate and a champion for your children and an inspiration to an entire community. Thank you. I like the idea of calling it a ‘prism’ 🙂 I’ve enjoyed finding and reading through your site. Do you think you could post a note on your blog about my film HOLD ME STEADY: A Story of Autism Service Dogs? This film is personal and important to me, because I have been involved with the autism community my entire life.